We’re just three days away from Brooklyn’s own ELEMENTS Music and Arts Festival, and the crew here at Sound Fix was lucky enough to interview one of our personal favorite artists from this year’s lineup. ELEMENTS holds a special place in our collective heart for obvious reasons: Sound Fix loves electronic music, and Sound Fix is based out of Brooklyn. If you haven’t been to a BangOnNYC! event, then you should clear out your weekend plans, rally up a crew, and get your ELEMENTS passes right now, right here. I urged a bunch of my friends to take a plunge last year, and when you simply bring up the word “ELEMENTS” to them, they’ll eat your ear off with mind blowing stories about music, friends, and straight up blissful insanity. Here are a couple anecdotes from last year: the organizers at BangOnNYC! set up a “fire stage” to embody the “fire” element, which was one of many elemental music stages. 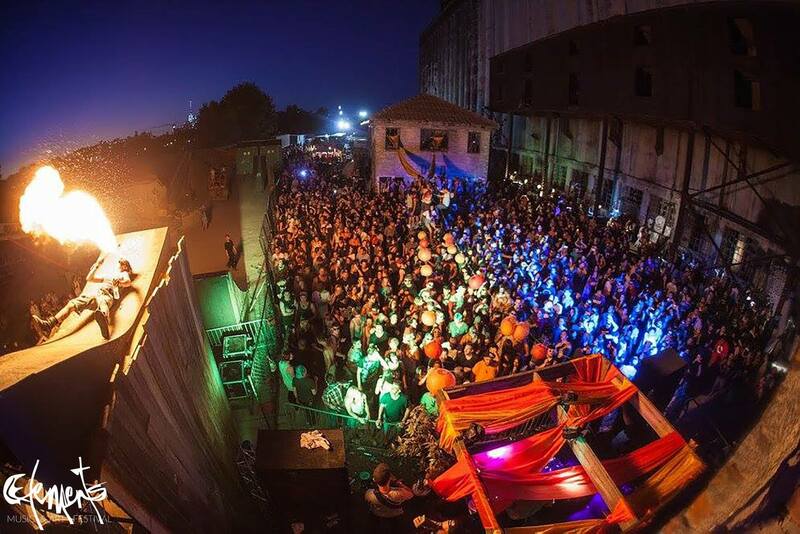 For this specific venue, they constructed a massive BMX ramp (depicted above) which projected professional bikers over fire-blowers as producers like Anna Lunoe and Autograf spun ethereal sets amidst chaotic fire and extreme sports. This year, it’s been announced that BangOnNYC! is installing a stationary wave near the “water stage” for a professional wakeboarder to perform flips near the producers lined up to perform at that arena. These are all facts, not fiction: so just come. Anyways, I digress. The lineup is stacked this year with some of my favorite electronic music artists like Bleep Bloop, Gramatik, Mija, Oshi, and of course, the one-and-only Kiwi turned Aussie himself, Opiuo. For this event, kind of like last year’s (read our Liquid Stranger ELEMENTS interview here), we weere lucky enough to interview our favorite artist on the lineup. If you’ve never heard Oscar Davey-Wright’s music before, you’re in for a treat. In fact, while you read this interview, click “play” on the two tracks I’ve included below. You’ll get what I’m talking about as you read, listen and learn. He’s a producer ahead of his time who’s coming off of one of my favorite LPs in a long time. It’s not very often you get the chance to catch a producer who that year released his magnum opus, (the Omniversal LP), so if you have an ELEMENTS ticket, make sure to find yourself with your friends at Oscar’s stage on Saturday. So enough from me, enjoy the view from inside the mind of Opiuo, and make sure to check out his full LP right here. Sound Fix: Hey Oscar, thanks for taking time here to answer some questions for our readers and your listeners. To start things off, let us know what you’re up to over the next few weeks this summer. Oscar Davey-Wright: I’ve just returned from Shambhala Festival in Canada, and am about to spend some weeks making music in New Orleans with friends both old and new. I’ll be playing ELEMENTS Festival plus a couple more in the coming weeks. I love the summer! SF: We’re really looking forward to your performance at this year’s ELEMENTS. What have you heard of this festival, and what can you reveal that you have in store for your set? ODW: I’ve heard nothing but amazing things! Also, I love New York City, but especially Brooklyn. I have loads of new, unheard musi, as well as tons of VIPs and edits to perform live from my latest LP, Omniversal. SF: Speaking of which, you just released your newest LP, Omniversal. “Jelly” and “Sneakers” are generally the first two songs I show people when introducing them to your music. Tell us about the creation process behind this record, and how it compares to your other bodies of work. ODW: I’ve spent the last two years slowly working on new music, but wasn’t sure how it would shape up. At the start of 2016 I took a couple months off the road and just had as much fun as I possibly could making music, recording musicians, and going deep into creation. It flowed well and the result is what you hear on Omniversal. I wanted to make a journey with that record. I was feeling free to do what I wanted, mostly due to the support of my amazing fans, which made it easily the most enjoyable album process yet. SF: Cool man. What inspired you to create the Opiuo Live Band, and what plans do you have looking forward for this project? ODW: I grew up playing music in bands and always wanted to incorporate my love of electronic and organic music together. It’s a totally different but equally satisfying outlet of creativity for me. I finally felt that I could do it properly onstage, so I dived head first into figuring it out and spent 6 months planning and rehearsing before our first live show. We’re now working on new music and shows all the time, and I feel like we’re really just getting started into the possibilities of live electronic band performance. SF: What particular area of Australia are you (currently) from, and how would you say the Australian electronic music scene has evolved over the years? ODW: Well, I’m actually originally from New Zealand. Ha! But I’ve lived in Melbourne for around 11 years. I feel Australia’s scene has evolved and expanded dramatically into leading the world in many genres of electronic music. There’s a freedom down under to do what you want to do. I love it. It’s refreshing and not oversaturated. SF: Where’d you think of the name “Opiuo,” and what meaning does it have? ODW: It has no meaning at all, and I love that about it. It’s more of a phonetically pleasing shaped word for me. Something that completes my OCD tendencies. SF: Tell us about your goals over say the next two years. ODW: Make more music. Push myself. Love those around me. Support my friends. Travel the globe. Play bigger shows with my friends. Take the band & solo shows to the next level. Release EPs and a new LP. Challenge myself. Be truly happy. Be myself. SF: I love this one. What’s the craziest story from a performance during your career that you can share in this interview? ODW: It didn’t happen to me, but witnessing a friend have someone rush the stage during his set only to steal his headphones and then proceed to try and eat the ear pieces was completely crazy! SF: Wow, I can only imagine. Speaking of music, what new stuff do you currently have in the works? ODW: Collaborations with so many of my favorite producers, a ton of new solo stuff, and some brand new live band musical adventures. I’m hoping to have some of it out before the end of the year too! SF: We like to end our interviews with an open forum. Is there anything else you’d like to share that we haven’t touched upon here? ODW: Nothing in particular, but I’d like to make a shout out to those people out there who follow their heart and remain individual. It’s you who make this world a beautiful place. Let us dance till we die.